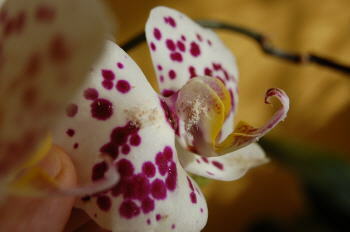 On this page we will describe the different problems that we can find caring our orchids. Before we have a differentiation according to the origin of the problem, we talk about diseases (due to fungi, bacteria or viruses), pests (insects caused by parasites) and problems associated with a poor farming conditions (light, temperature, humidity, etc..). Clearly these factors are closely related. 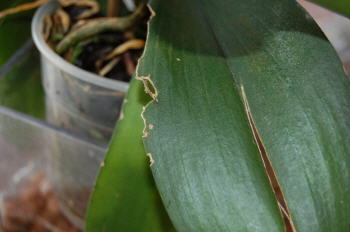 So, some poor ventilation and humidity can be a easy way to get our orchids infected. But before we delve into the treatment of diseases, some guidance will be exposed to prevent and avoid illness. 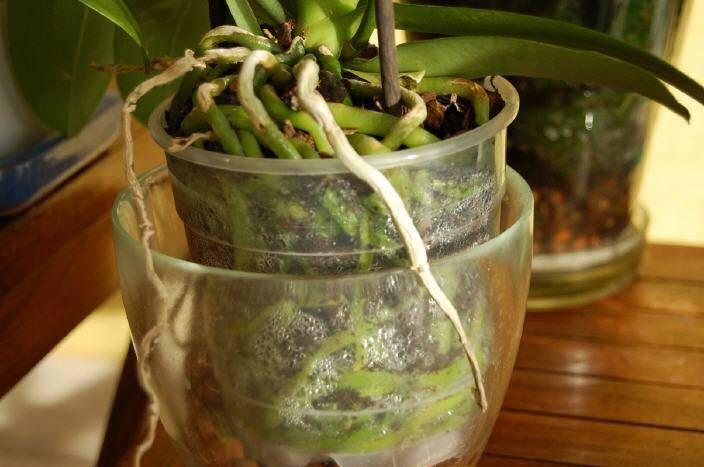 One of the most conclusive evidence about the health of an orchid is the status of its roots. Therefore, we should always first look at them rather than any other part of the plant. 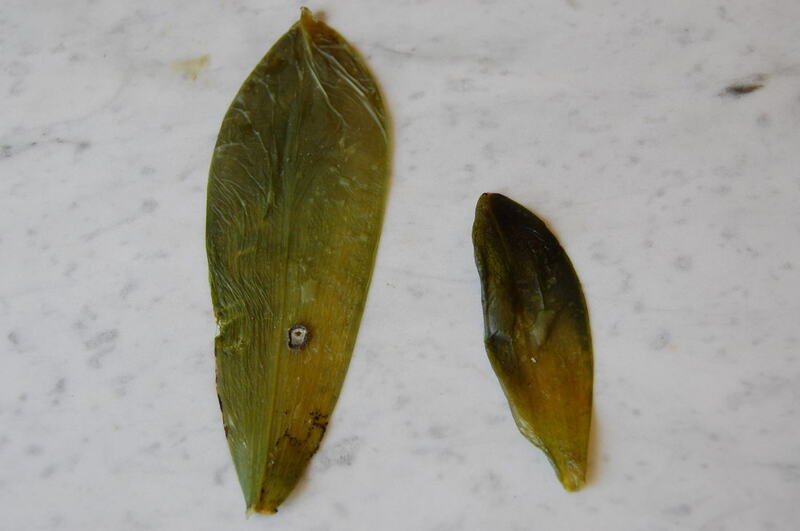 A green estate with a hydrated texture indicate good health, dried roots (white) indicate lack of water. Meanwhile, the dark color usually indicate that death of the plant. It is normal that all plants have some fragments that die, this is not a sympton of illness, the plant creates new outbreaks, it is eliminating those older. However, in a healthy plant must prevail strong roots, hydrated and a light green color. In some species, the observation of the roots can not be carried out with as much detail because they do not use transparent containers or their roots are not aerial. (dendrobidium, oncidium, cattleya, etc..). We must be vigilant to the moisture level of the substrate. It is generally advised to leave it to dry slightly between waterings but without thorough drying. The color of the roots will give us clues about the humidity level. Remember that when the roots are White it is an indicator of lack of water. In any case we should avoid standing water and drainage must be perfect. We also prevent water spray irrigation or be retained between the leaves at the portion which bind the stem. After the observation of the roots, a periodic look of the leaves can spare us many problems. We must be attentive to the coloring. A dark brownish green is indicative of excess light and can burn the exposed part. The different shades of green in its middle range would be a suitable indicator light. Yellowing of leaves may indicate lack of light. Another important parameter is the texture of the leaf. 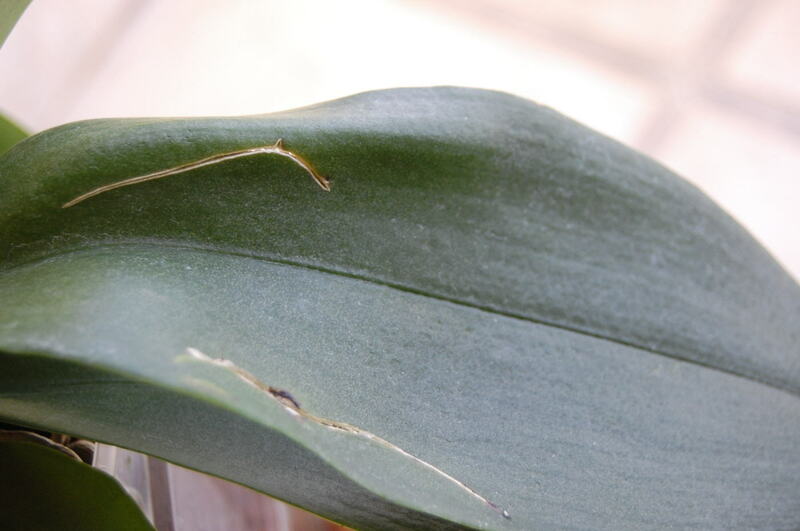 The leaves of the orchids are storehouses of plant nutrients. Fallen and weak leaves can assume lack of water, nutrients or disease. Contrary fleshy leaves projecting upward force are indicators of good health. Finally we note the presence of stains, discoloration or texture in some areas, cracks or marks on the leaf. It is about an early detection of insects, fungi or bacteria and treating time as discussed below. Dried Leaf - Leaf with sunburned end. As far as possible, it is highly advisable to have instruments to measure temperature (maximum and minimum) and moisture. These measures give us information on two basic factors for the care of orchids. In our section: Caring at Home, is available all the necessary information about humidity values and temparature. Here are generically distinct common diseases as the causative agent. Remember that these diseases may occur together if the necessary conditions. So fungi and bacteria can attack simultaneously if there is excess moisture or poor ventilation. In turn, the presence of certain insects (aphids) may facilitate the spread of the fungi. 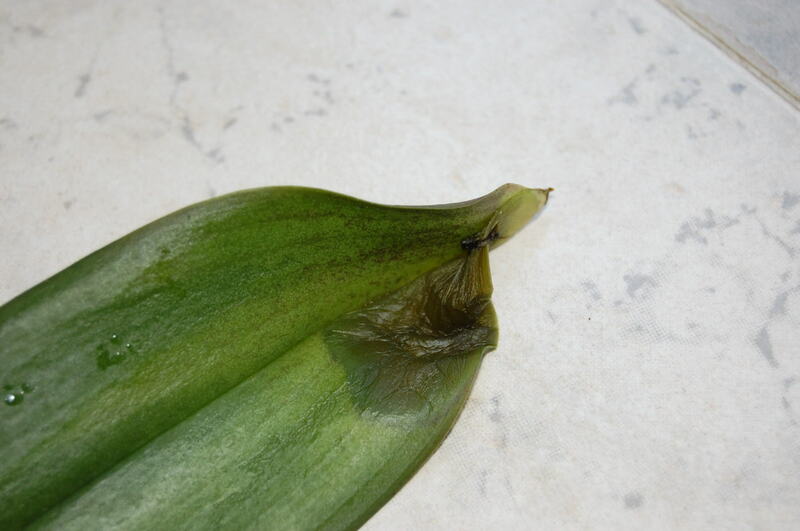 Fungi are one of the main scourges of orchids, however, can be successfully combated if we detect the problem early. 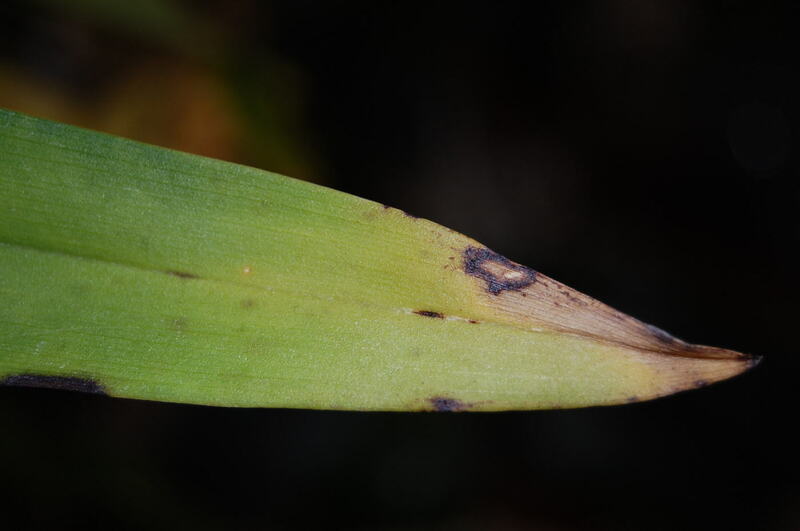 Generally present with dark spots on leaves and flowers. They can also do this by changing the color of the leaves to a tone that can vary from yellow to brown, black or gray, depending on conditions and the type of plant. Normally, an excessive moisture or water retention with high temperatures and poor ventilation facilitate the appearance of fungi in their various forms. The best measure is to control all of these conditions and use a specific fungicide preventively especially in spring. Consult first your gardener because orchids are very sensitive to any type of chemical treatment and some generic products may burn the leaves. Below some examples are presented of fungal infestation. (place the cursor over the picture to enlarge details). 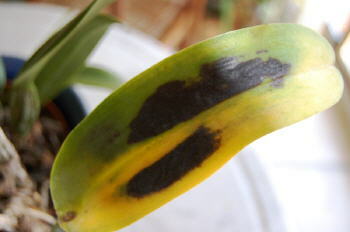 Phalaenopsis Orchid with discoloration on leaf base. 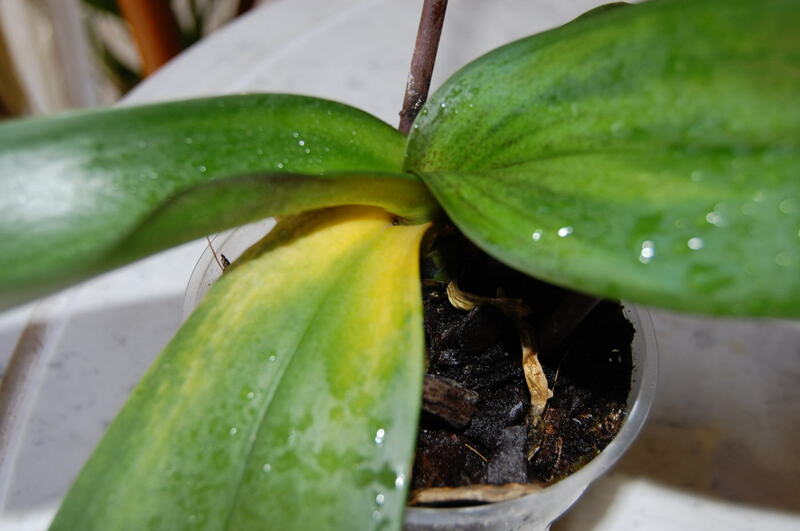 Normally, when the leaf begins to turn into a yellow color in this area, it is often a symptom of disease. When it does from another part of the leaf is usually less severe and can be due to natural causes. These plants, in the normal course of evolution, usually throw older leaves to create new ones. 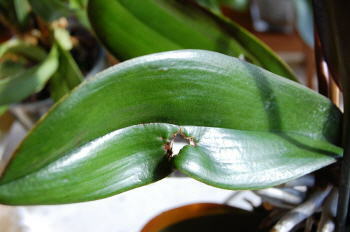 State of roots in the previous orchid. Fungi have first attacked the roots and caused its death. Gradually the leaves have been turning yellow and falling down because they are not able to get nutrients anymore. In this case there is no solution. In these two pictures the roots of a phalaenopsis (detail on the side and bottom) are shown. Some white patches like small pellets that are grouped in small colonies are observed. 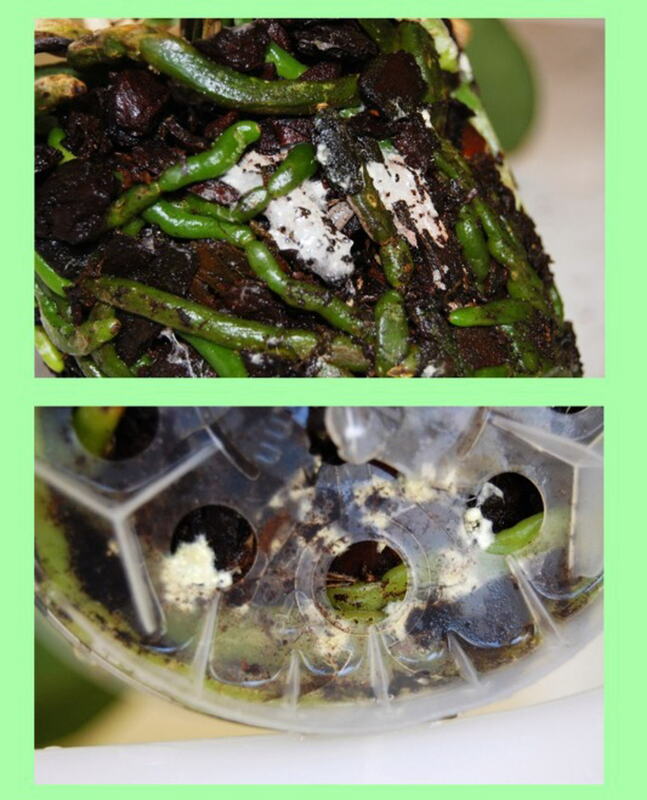 The first impression is that they are egg of some insect, but the roots are green and there is no indicatione death. Interestingly, plants that have this type of fungi usually are the most heathy ones. I do not know if it is due to some sort of symbiosis or simply fail the fungus optimal plant conditions to manifest. In any case they do not seem to attack or harm the plant. Bacteria are pathogens that often cause spots on the leaves or pseudobulbs with a common appearance of watery texture and darkening. The parts of the plant that are infected lose texture and die quickly. 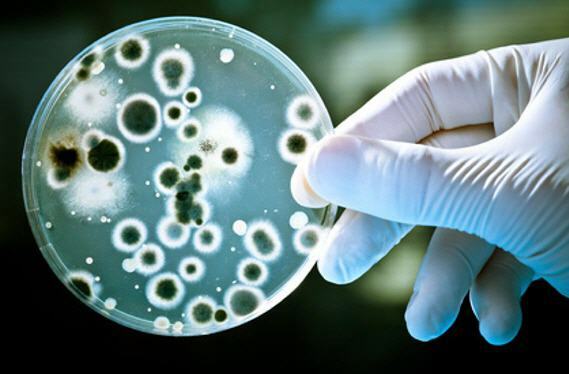 Bacterias usually need high humidity to develop but once they have infected a plant it is often lethal. The recommendation is to cut the affected part, isolate the plant and do not water for a while to prevent their proliferation. Sometimes bacterial attack occurs in the neck of the plant by water retention. 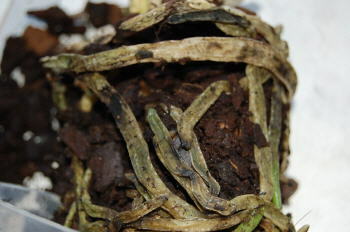 In such cases the plant can die quickly because of rotting of the main stem. Ensure that no water retention occurring at the base of the leaves. There is no effective chemical treatment, however, if you detect the problem in time we can try to disinfect the affected area with powdered cinnamon. Cinnamon is a powerful natural remedy with antifungal, antibacterial and insecticidal properties, also has no side effects on the plant because it is a natural product. Leafattacked by bacteria and the typical watery texture. In this case the problem is focused on the base of the leaf and may indicate that the base of the plant is also affected. Decaying leaves after bacterial attack. 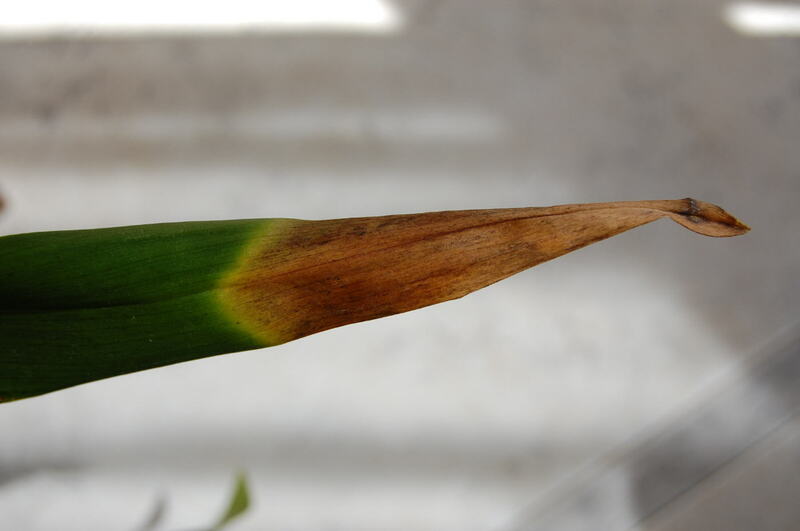 This leaf presented bacterial attack identified in time. The hole left the infestation once healed the wound is seen in the photo. The treatment was based on sprinkle cinnamon powder on the affected area and reducing the moisture level in the substrate. Virus are also another common problem. Their attack causes a variety of symptoms. The most common symptoms are dark spots or dots / black leaves. Typically, involvement usually occurs in the upper part of the leaf but can appear anywhere. Other symptoms include chlorosis (yellowing leaves), malformed leaves and flowers. There is no effective treatment. If we detect the problem in a certain area, the best thing to do is to cut with a tool previously disinfected. If the plant is very empowered must proceed with removal (preferably by burning, if possible, to eliminate the virus). A Cambria leaf affected in different parts. This leaf is affected in the edge. The damaged area has not been as a result of sun exposure but probably a virus attack as it progresses downstream. In this case, the affected leaves were cut below the injury and the wound disinfected with cinnamon. Pests and infestations include attacks by small insects that normally live on plant nutrients and therefore create problems of various kinds. The most popular and common are called aphids. These tiny insects live sucking sap from plants that colonize. Their development is very fast and can create extensive colonies shortly. In addition to direct effects on the plant (stop growth, malformations, etc..) Can transmit a variety of diseases, especially virus. Other parasites that attack our orchids are mealybugs (normally distinguished by having a White cottony texture ); mites (eg red spider) that usually attack to outbreaks producing malformation and the presence of small marks; insects called sappers who specialize in creating small galleries inside the leaves, appearing on the outside of the blade markings by way of lines or cuts; eventually we include other insects (small caterpillars or other) that directly eat the leaf and erosions occur, especially at the edges of the leaf. The basic treatment is insecticide and acaricide. The use of so-called ecological suggest (such as neem extract) as they are less aggressive. In any case, before purchasing an insecticide, consult your garden center with the ability to use orchids. Cinnamon may also be utilized in powder in cases where infestation is not very severe. 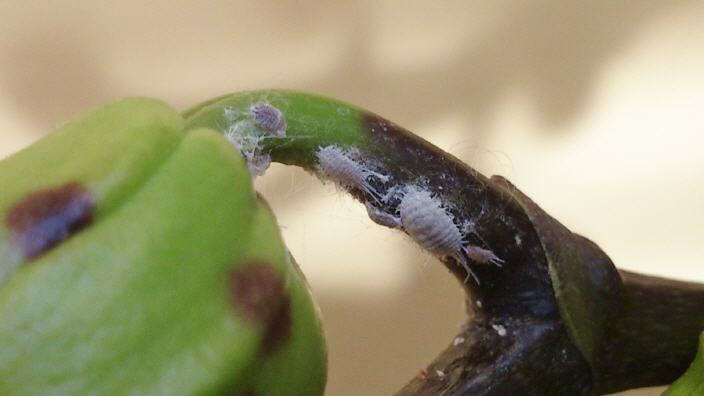 In this and the next picture we see an attack on the flower stem by the cottony mealybug. Usually cleaning the area with a brush dipped in alcohol (ethanol) or a specific insecticide suitable for orchids with which should treat entire plant is enough. 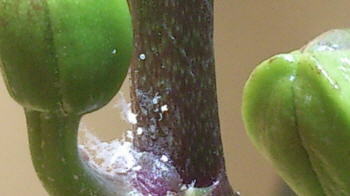 In this photo mealybug colonies on 2 areas of the flower can also be seen. Arrivals to the flower, mealbug must have also invaded other parts of the plant (leaves, stems, etc..). Shall be carried to a treatment of all of it, avoiding direct spraying on the flower. 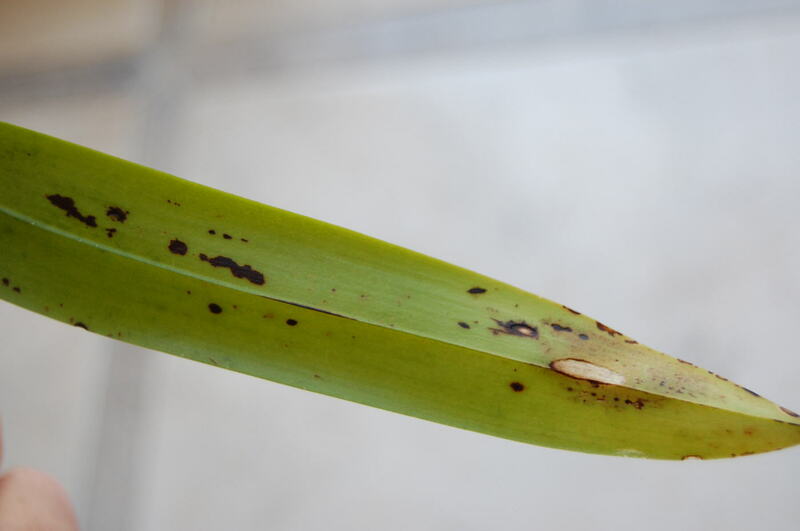 In this plant, the leaf has been attacked by some kind of insect on the outside producing erosions. Signals that have been drilled mining insects inside the leaf. A part of disease or parasite attacks we discussed earlier, orchids can be irreparably damaged due to a poor environmental conditions. Also, do not have the basic necessities of light, temperature, humidity or other, weaken the plant and favor, according conditions, the emergence and proliferation of the diseases mentioned. Here are the symptoms of a bad environmental conditions are presented. Lack of light. Flowering does not happen. Weak stems, the plant loses vigor. Leaves very dark green color. Find a better location. If not possible, supplemented by artificial lights (lamps, Low pressure sodium or similar). Lack of humidity. Lack of moisture in the substrate may occur also in the air. If this happens, the leaves shrivel and lose vitality. The plant appears wilted flowers and stop developing. White roots. It is possible that after a prolonged period of low water, some leaves turn yellow and fall. Spray watering more often. Install a humidifier that we can control, as needed. Temperatures out of range. Excess or heat fault produces fall of the flowers and detention in the development of the floral rods. To correct by means of the appropriate elements the imbalances (disruptions) of temperature. Change the location. Excess of irrigation. When an excess irrigation water retention or poorly drained soil,the roots tend to rot acquiring a dark color and a flimsy texture. Leaves progressively gain yellowing and ultimately the plant will die. Wait until the soil is somewhat dry between waterings. 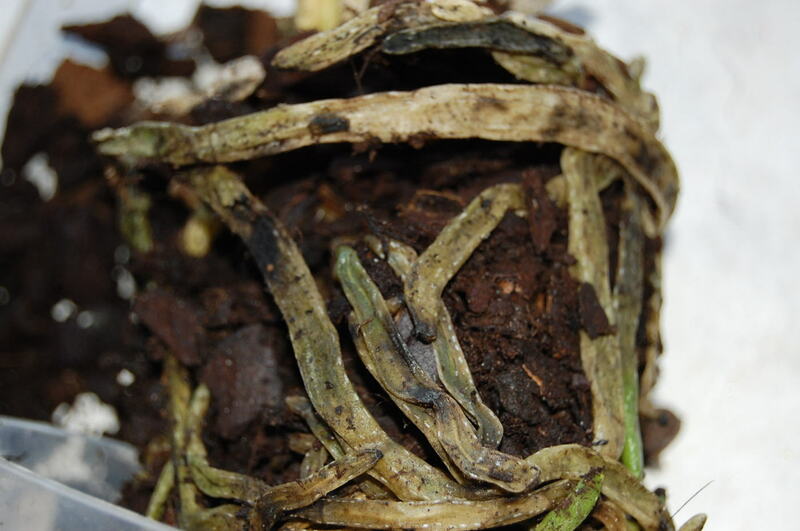 If the roots have begun to rot, it is best to transplant new substrate, removing (cutting) previously diseased parts. It should also proceed disinfected container or container plant. Burns for the Sun. The leaves that are sunburned often take a yellow or dark Brown color. Remove them from the current location. Cover the windows with a curtain that filters the sunlight. Excess of fertilizers. It can produce yellow leaves in egdes. Stop fertilize the plant temporarily. Watering with soft water only. Exhibition to organic gases. Orchids are especially sensitive to organic gases (given off by the rotting fruit, animals or other). The effects on the plant result in wilting and premature fall of flowers. The orchids must be in a drafty well environment and in that there do not center organic gases of any type. Presence of pollinating insects. Pollinating insects are not in itself a threat to the plant, however the pollination of the flower represents the enclosure (once fertilized) and subsequent fall. Therefore shortens the life of the flower. To maintain the highest open flower time we avoid the presence of pollinating insects. To do this take the necessary measures to prevent access. No conventional insecticides are recommended as they can damage the plant. Draughts. Cause premature flower dropping. Though the orchid needs a good ventilation, the majority of the species (except the Vanda) do not like draught. Therefore, it is necessary to avoid that draughts come to the plants of a direct form.